Versi Lite flush mount LED luminaire from Lithonia Lighting has an expected service life of 50,000 hours and produces 660 lumens with a color-rendering index of 85. 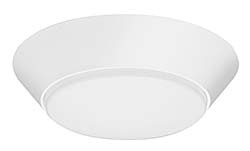 The 7-inch luminaire is available in 2700K, 3000K, 3500K and 4000K and is dimmable on standard TRIAC dimmers. Mounts directly to a 4-inch junction box.